Thanks to occasional visiting lounger Derek Brake for drawing my attention to an interesting article in the November/December issue of Scientific American Mind. 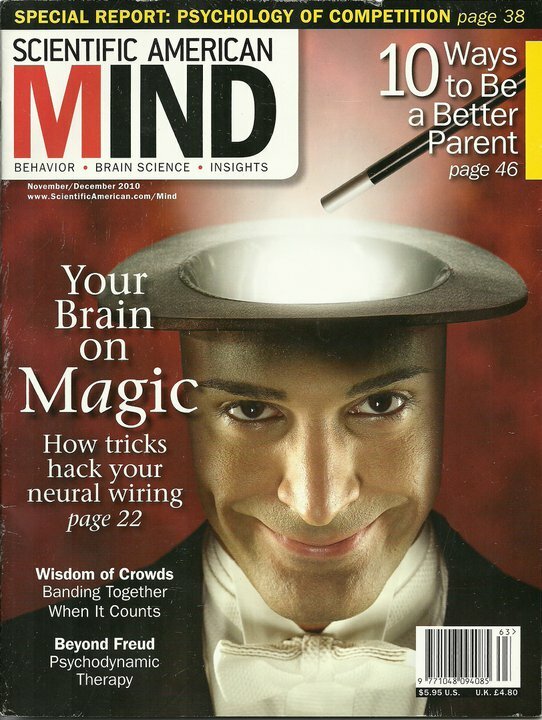 Entitled Mind Over Magic it offers a neuroscientist’s perspective on the way magicians exploit loopholes in the way our brains perceive the world and direct our attention. Most of us use these techniques without really thinking about them, but it’s well worth looking at what authors Stephen L. Macknik and Susana Martinez-Conde, with Sandra Blakeslee, have to say about what is actually going on in a spectator’s brain while observing magician and pickpocket Apollo Robbins performing some simple close-up effects. The article is an excerpt from their book I think – Sleights of the Mind. By Susana Martinez-Conde, Stephen Macknik, Sandra Blakeslee.